As I approach my 2nd anniversary of living in Munich in September, I’ve started to think more about how I’ve settled into my life here in Munich. More on that in my post about The Settlement Curve. 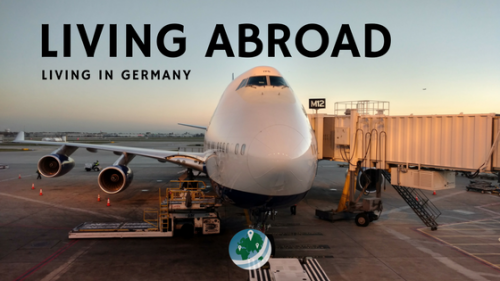 A huge part of living abroad is adjusting to the new culture, circumstance, and life you find yourself in. One weekend afternoon while riding along the Isar on my bike, I realized something. I feel at home in Munich, and a big part of that was realizing that I love summer in Munich. I think I had been building up to this realization over time. My master’s program is in the home stretch. At this point, I think I’ve explored enough of my new home to understand it more intimately. I’ve found an awesome group of friends, and of course, I live with my wonderful German girlfriend. All that has contributed to making my life here easier to settle in to. All those things came together as I was biking along the river towards a relaxing summer afternoon on the shores of the Isar. Coming from Chicago, where summertime is almost famously wonderful, it took me a while to get used to the speed of things here Munich. However, I have definitely learned to love summer in Munich. Summer here is all about enjoying the sun, the water, and some great summer food and drink. I mean, what’s a barbecue without the German staples of beer and bratwurst? 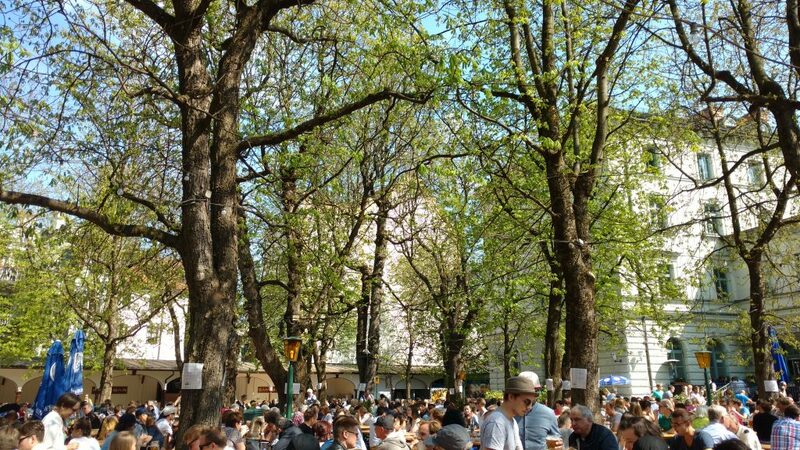 Biergartens are probably one of the most recognizable staples of summer in Munich. If you’ve never been to a proper beer garden, imagine this. A large area filled with people sitting at long wooden tables on long wooden benches. Most everyone is merrily putting down 1L of beer at a time in the cool shade of the old chestnut trees above. Usually, people bring some pre-made picnic dishes to eat in the garden, or munch on a big soft pretzel with Obatzda from the food stands. Here’s a shot from our local Biergarten… in April! The leaves on the chestnut trees haven’t quite grown out yet, but still, everyone was eager to enjoy the first good-weather days of the season in true Munich form! These public community drinking areas are just plain good for the soul. It’s not only the beer, or being surrounded by friends, I think much of the Biergarten magic comes from the community. With everyone else around in a good mood and enjoying the same atmosphere, everyone feels a little more connected. Sharing a joke or starting a conversation up with the stranger sitting next to you is totally acceptable, and actually pretty common. On any given summer evening, work day or weekend, our local Biergarten ranges from pretty filled up to completely packed. Everyone just seems to enjoy the shade of the chestnut trees as they down Helles and Radler with their dinner. I wonder, how many liters of beer have been drunk under the shade of those chestnut trees? Cycling is simply one of the best ways, if not the best way to get around Munich. All year round, the over 1,200km of bike paths, trails, and lanes are packed with cyclists. People use it as a way to get from A to B, yes, but cycling is a major recreational activity in the city as well. We bike to Biergartens, pools, parks, the river, lakes, forests, and just about everywhere else in and around the city. It’s no wonder why, either. The city has built 14 major city-wide bike routes that connect the far-flung corners of Munich with the center. Additionally, there are ring routes that connect the cross-city radial routes to each other, both within and outside the city. More info (in English!) from the city on biking in and around the city here: Biking in and around Munich. A shot over the Isar showing the adjacent bike path on the east side of the river. The path on the west side is hidden by the mini-forest stretching along the riverside. I’ve also found another great resource in bikemap.net for tons of user-created info on the routes and destinations around Munich. The map below shows one of the routes down to Lake Starnberg (Starnberger See). It would be great to bike there in the morning, enjoy the lake and the town, and then take the bikes back to Munich on the S-Bahn in the evening. 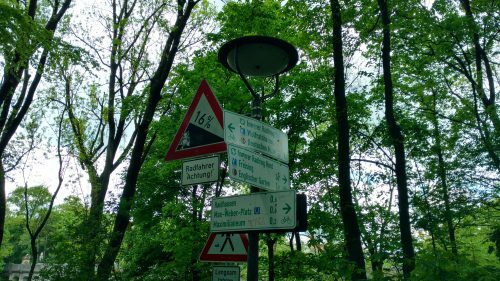 The route spends lots of time in the forest to the southwest of Munich, but I imagine riding through the town of Gauting to the west would also be a good option. 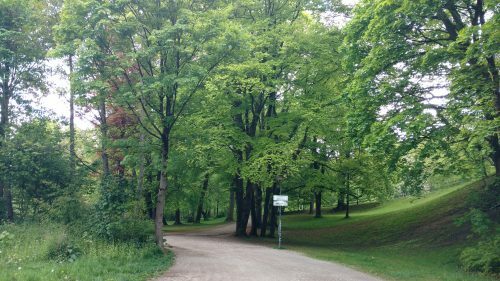 As you might imagine – the city’s cycling paths are even more packed during the summer in Munich. The ones that take you through the city’s numerous natural green areas are especially busy. Luckily, they’re not so packed to be over their capacity, with the exception of a few bottlenecks. The ability to easily and quickly escape the hustle and bustle of the city by hopping on my bike is a treasure. Taking it easy cycling along this riverside path. A very busy signpost, warning bikers of the extreme grade coming up, and showing the directions and distances to many of the destinations on these sign-posted routes through the city. 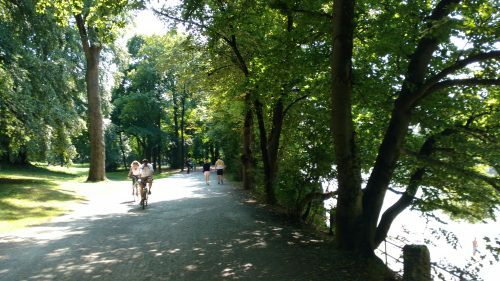 Following the route along the Isar is a great way to feel like you’ve escaped the city and breath some fresh air, but it’s also a great thoroughfare between the north and south sides of the city! As popular as cycling is here, I think grilling might be even more popular. It seems like everyone has their little portable charcoal grill to take with them to the Flaucher area (English Trip Advisor page), which allows open grills. Actually, I know quite a few people who have been smart enough to combine the two. They take their grills, charcoal, food, and beers, all by bike, to their grilling area of choice. This is usually somewhere along the Isar, but it depends on where people live. Grilling is allowed in many public places around Munich. Just see the map from the city below, and more info on grilling in Munich (in German!) can be found here: Grillen in der Stadt. Most of the necessary stuff I mentioned fits in the space provided by a typical bike basket and a backpack. You might want to throw in something to sit on, like a beach blanket or a couple towels. A portable Bluetooth speaker is definitely also recommended. I recently got a basket for my bike, so all I need now is a portable charcoal grill. With all that together, I’ll essentially be able to carry around my own personal grill station with me on my bike. Another step towards being really settled in here, and enjoying summer the way the locals have perfected. While I don’t have a portable grill, I did pick up this grill for 30 Euro a couple months ago. We found it on eBay-Kleinanzeigen, essentially a mix between Craigslist and a newspaper’s classifieds section. We don’t have a car, so we had to take it back to our apartment on the bus! No problem, there’s no extra ticket for doing so in Munich, though I wouldn’t be surprised if that were the case. The fare system in many German cities is often irrationally complex. 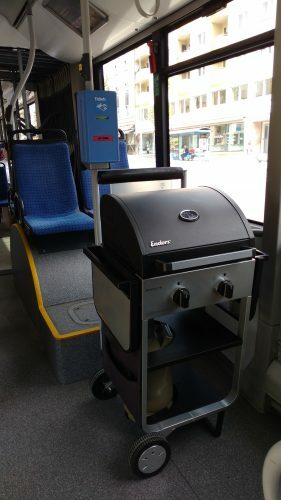 The grills on the bus go – nowhere! I made sure there was no extraneous rolling action on behalf of our new (to us) grill! So I’ve mentioned biking and grilling along the Isar a couple of times already above. But what else do people do all day there along the river? Well, swim of course! The greatest thing about the Flaucher area I mentioned above is the water. 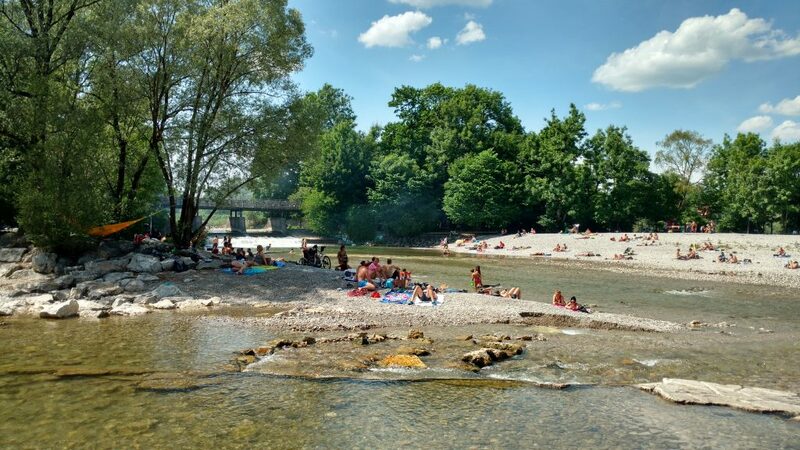 Whether you’ve just arrived at your grill spot with all your gear and you need to relax, or you just want to cool down on any afternoon, swimming in the Isar is just about the perfect way to do it. 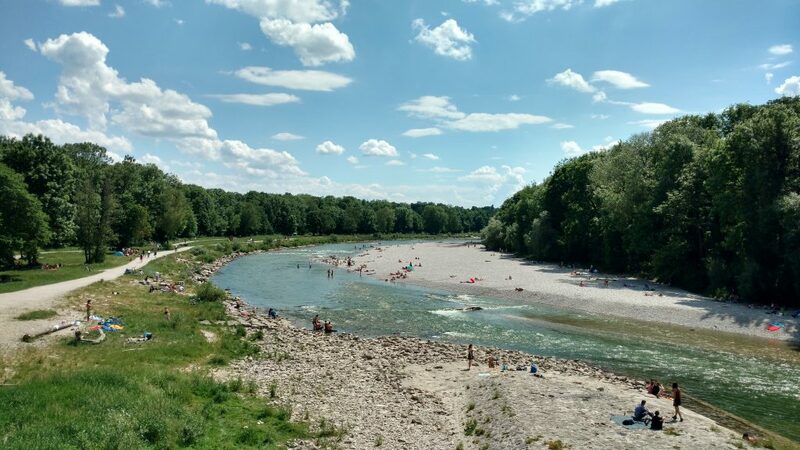 Where can you jump in for a dip in the Isar? 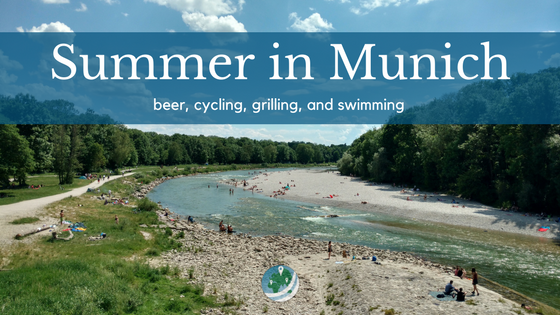 A great spot in the Flaucher area to go for a dip in the water to cool off during a day grilling out in the sun! A dip into the chilly direct-from-the-Alps water of the Isar is a luxury I’ve grown accustomed to. Swimming around the Flaucher area is all about finding the calmer pools of water dotting the area. 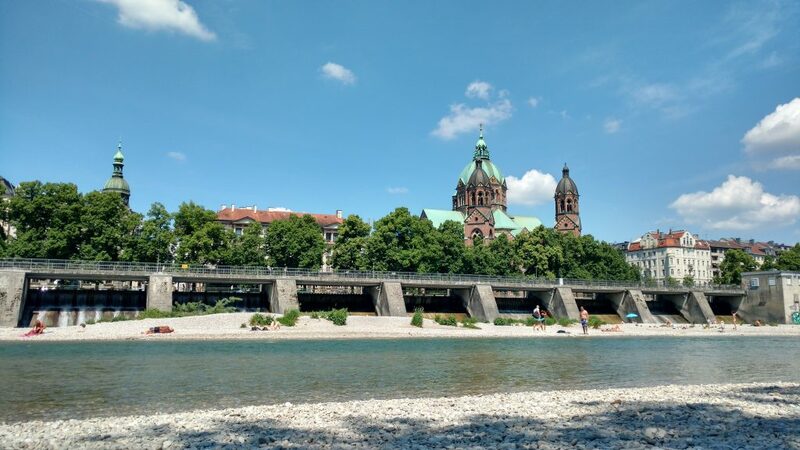 However, there are a couple of other areas along the river that are suitable for a splash, like the areas around St. Lukas Church and Prater Insel. In these areas, the Isar is split in two, and the swimmable area is more of a mountain stream than a full-blown river. The current is really swift, so it’s best to walk a bit upstream and float back down as you enjoy the water. This spot along the Isar near St. Lukas (in the background) is a little closer to our apartment and more central in the city. It’s a nice spot, but the current is really strong, walking upstream and floating back down is the best plan of attack. Rafting down the river in inflatable boats is also a pretty common activity on the Isar. There are several sections which are great for rafting down with a couple friends. I’ve never done it myself, but I will before this summer is over. I’ve had a little raft/tube on my Amazon wish list all summer, as well as a smaller float meant to suspend a case of beer in the cold water and attach to my personal tube. What an absolutely genius little invention. Once I finally tube down the river, I think I could say I have truly experienced summer in Munich. I’m sure I could have included many other things that make summer here so great. These are just the activities that really stood out to me. Munich may not have all the commotion of variety that Chicago has, it is a much smaller city. However, summer in Munich is just as fun in its own way. Any more suggestions for what I should be doing to take advantage of some other parts of summer in Munich? 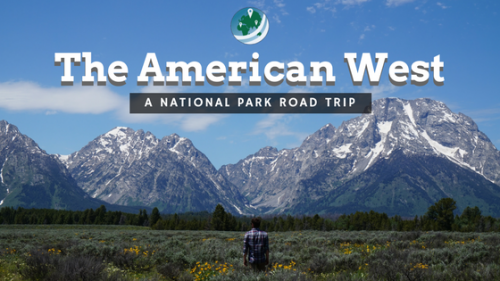 Do you have some favorite unique summer activities where you live? Let me know below! Looks like a great place to live! Never been to Germany before! And that grill in a bus? 😀 Amusing! I would have done it too! Anything for a great meal! The grill on the bus was a necessity! 30 euro for a fully functional grill, with gas tank (around 30 euro by themselves! ), and a bit extra for some great grill utensils. With a deal like that, there was no way I wasn’t going to enjoy grilling on the balcony in summer!! Looks like your reasons to love Munich are pretty similar for those why I loved living in Berlin! I am not big beer drinking person but I did enjoy those beer gardens or even the freedom of drinking legally in public ! I live in London now, and it is super annoying when you try to go to the pub in the afternoon and you cant even get to the bar sometimes as its always packed! Inside and outside! I also loved biking while I was there! I feel so much safer than everywhere else in the world ( well maybe besides my village in Poland, as there is not too many cars 😀 ) Great post ! 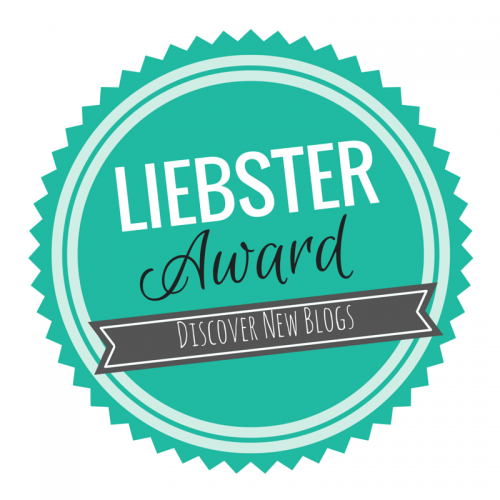 Ada – thanks a lot! 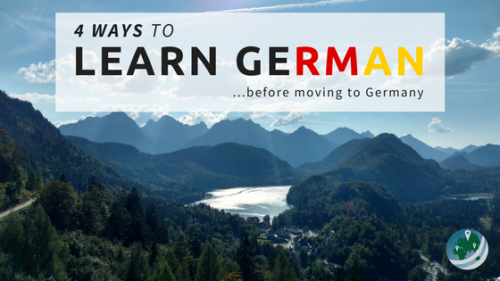 You hit the nail on the head with all your points re: having a beer walking down the street, plenty of space in the pubs and gardens, and a safe biking culture – I think all that (and much more about living here) contributes to one thing I always tell people about living in Germany. That it’s just easy to live here (compared to the US). Thanks for the input! Enjoy London, I’d gladly live there as well – if I had the money… haha! I always thought it was an awesome story – how the Chestnut tree became the tree of choice for beer gardens. You need to visit one (or better, a few) if you do visit Munich. First beer’s on me!